this patent is a part of the portfolio of 7 US granted patents and 1 US Continuation application. 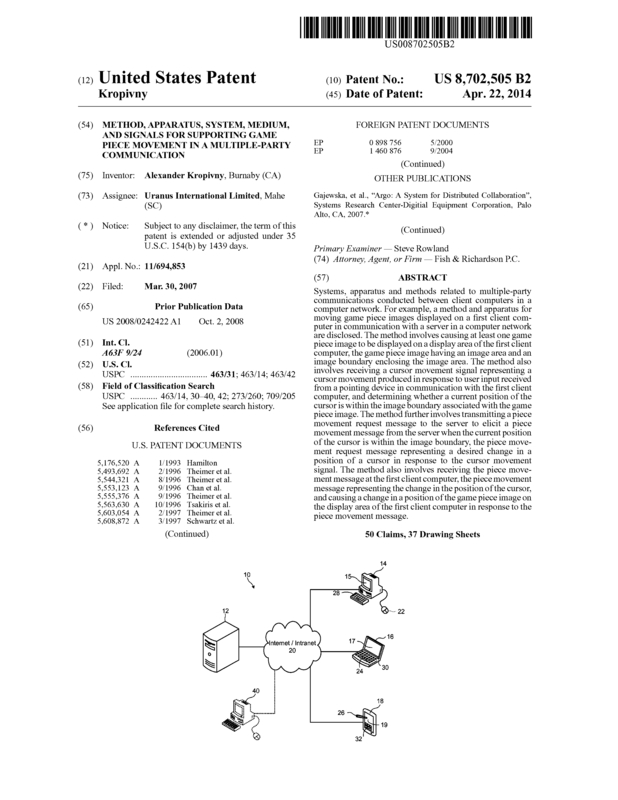 This patent brings Presence Awareness to online games like cards, chess, checkers etc. All players can see each others’ “hands” moving as they are playing the game in the virtual workspace. Cards can be picked up by players’ cursor and moved around over arbitrary paths and watched by everyone in real-time. Current technologies limit the users to predefined “deterministic” moves e.g. moving a card from one position to another over a predefined path. In contrast, Link demonstrates how players can participate in an online game with similar interactions and movements as playing in the real casino. Page created at 2019-04-25 20:03:46, Patent Auction Time.